Well, it’s very common doubt arising after learning the name of the next version of Windows as Windows 10. Why Microsoft don’t willing to name it Windows 9? As it’s a successor of the previous version of Windows 8.x. The real fact behind this name game has not official yet. But we analyzed it with various scenario cooking on the web. The number 9 is very familiar with the naming scheme of Windows. Of course, You can say how? In simple word, remind the naming history of Windows. Especially the latter of the decade of a last century (1995-2000). During this period, Microsoft launched well known versions of Windows, which includes Windows 95, Windows 98 and Windows ME. These versions of Windows are also known as Windows 9x family. I remember that, before an announcement of the Windows Vista, most of software’s minimum OS requirements were Windows 9x. Even though, that time was largely dominated by Windows XP. Most of the software that can run on Windows 98 also capable to run on Windows XP. Suppose, Microsoft released their new version of Windows as Windows 9 and after some period released the service pack as Windows 9.1 and Windows 9.2. Now think, XYZ company released the version of an ABC software that has minimum requirement has Windows 9.x platform. They will start to announce minimum OS requirement for their software is Windows 9.x platform. Which might create a confusion in the mind of a reader. Because, Windows 9x or Windows 9.x have a merely difference of a single dot. 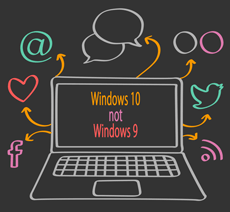 Although people of aware of the fact that the new software = new platform (Windows 9.x) and not an old platform (Windows 9x), Microsoft could be taking it as controversial. So, this is one of the reason behind Windows 10. The number 9 is considered unlucky In Japan, where Microsoft has good presence. To avoid an obstacle in the momentum of Windows in Japan, Microsoft became favorable to ignore the number 9 as a next Windows edition. History says that, in the same way the Trend Micro, a Japanese antivirus company did the same thing a few years ago that Microsoft is doing right now. Trend Micro was skipped the version 9 of their antivirus suite. Obtaining the out of box strategy can be helpful to fueling the sales of the product. Grabbing people’s attention toward the product (especially new) is the generic marketing tactic. With adhered to this practice, Microsoft may try to make people to discuss online-offline about their version strategy. Which will be a reason for mouth publicity; one of the most viral yet the free marketing strategy. 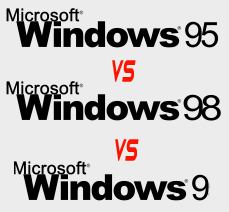 In my opinion, Windows 10 grabbed ample publicity via skipping the version 9. This may be a part Microsoft’s marketing strategy. So, this is my research on Microsoft naming strategy. Please do share with us if you have more relevant analysis on this topic. The reasonable analysis will be published with your credits.